y’s most popular brands, making integration a simple process. Identiv is a fully customizable solution as well if you wanted to add pre-printed 3,000 DPI graphics to your static background prior to your variable printing. Proximity cards are available in 100% PVC as well as a stronger composite composition. 125 kHz LF (low-frequency) proximity credentials provide an efficient, reliable, and cost-effective solution to existing or new physical access control systems (PACS). 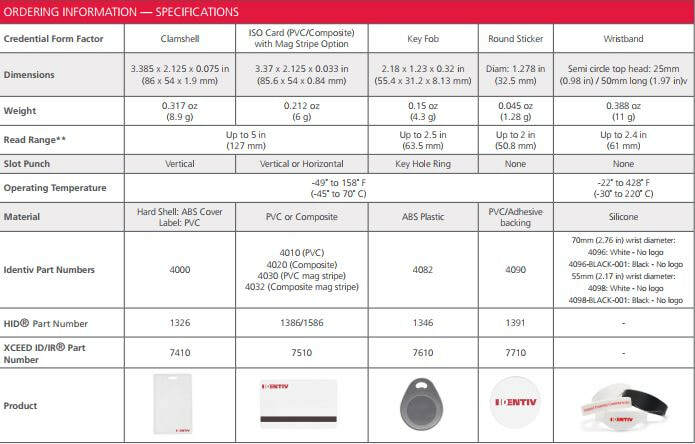 These generic credentials (credit card format, key fob, wristband, and round sticker) offer universal compatibility with today’s most popular brands, making integration a simple process.